A playground for adults and kids alike, Alto Adige offers world-class skiing, superb cuisine and fabulous wines, all set against the striking natural backdrop of Italy’s Dolomites. The Ciasa Salares hotel and its flagship restaurant La Siriola are must-stops for readers seeking the very best in Alto Atesino hospitality. The Wieser family has run Ciasa Salares for several generations. Inquisitive food lovers will find several restaurants ranging the gamut from simple to elegant, a meat curing room, a cheese aging cellar, a chocolate room, and, of course, an extensive selection of wines. 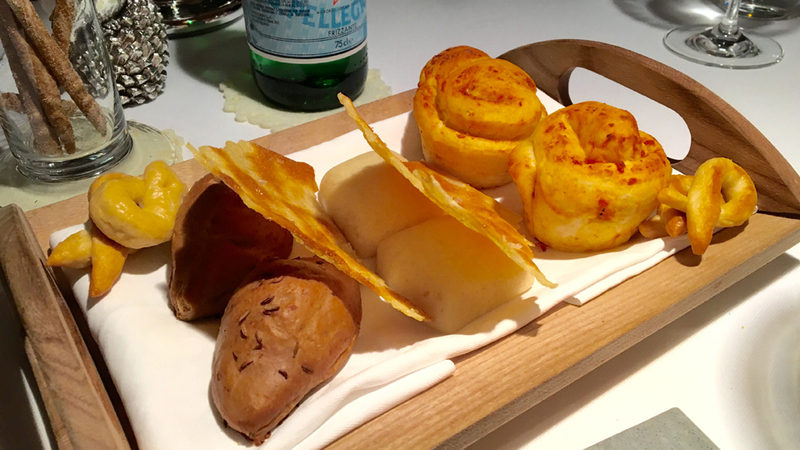 Ciasa Salares and its restaurants stand apart from current thinking in food in that both the menu and wine list are decidedly international in spirit. 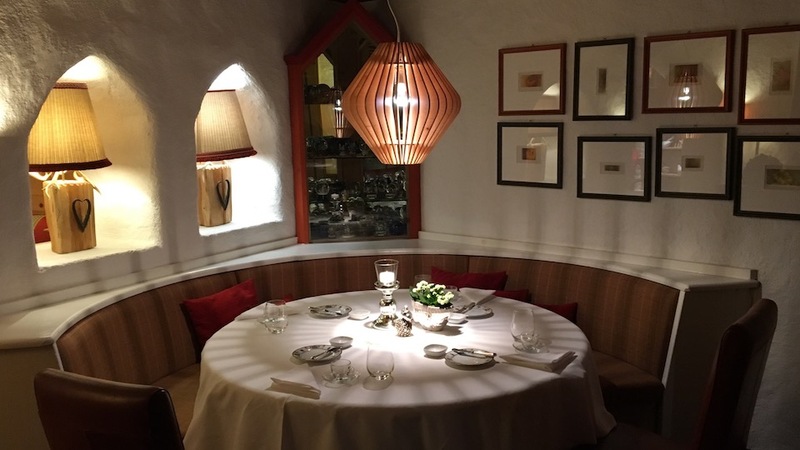 A rich fabric of stylistic influences comes together at La Siriola, where Chef Matteo Metullio’s daring cuisine attracts visitors from around the world. A native of Trieste, Metullio honed his craft at a number of top restaurants, including the nearby St. Hubertus, one of the most famous restaurants in Italy. 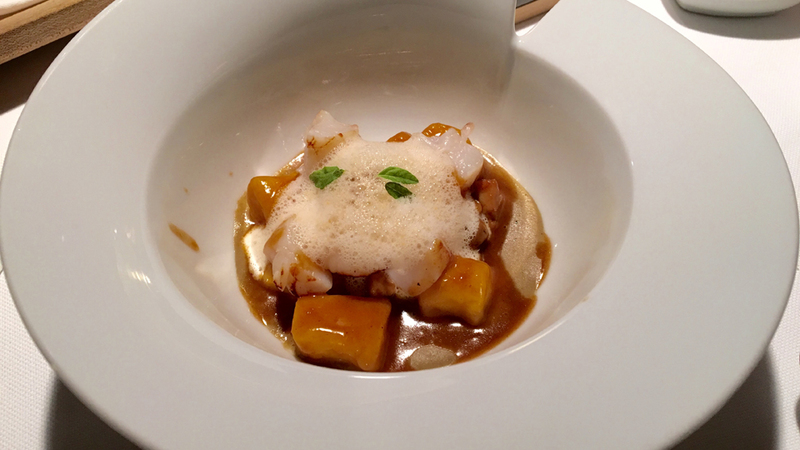 In 2013, at 24 years of age, Metullio became the youngest Italian chef to hold a Michelin star. Today he still has a level of child-like enthusiasm that is contagious. 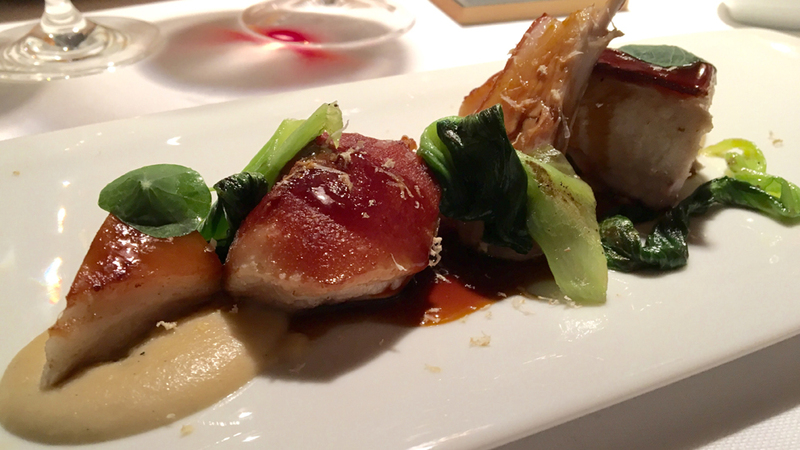 This recent dinner at La Siriola was truly exceptional. Although I hate to make comparisons across countries and regions, I found this meal much more satisfying than a dinner I had a three-star Michelin restaurant in the US the week prior. Metullio offers five thematic four-course tasting menus, along with a more comprehensive eight-course menu as well as à la carte dining. 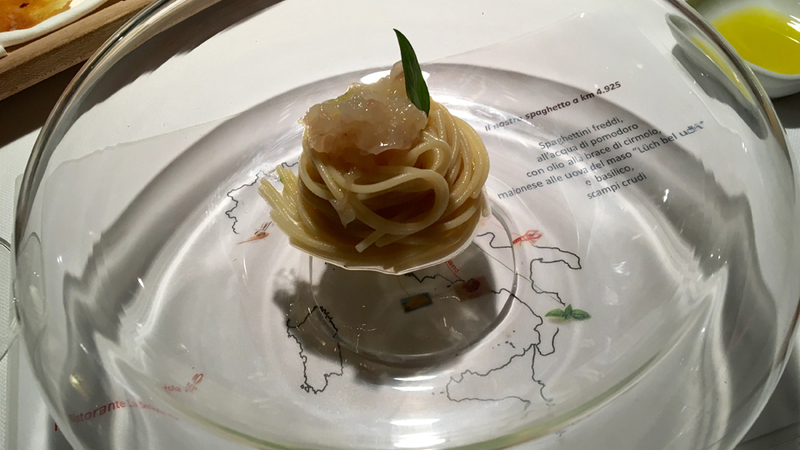 We opted for the ‘Larice’ menu, which is designed to as a marriage of elements from the sea and land, and added the signature Spaghetti Freddo a 4,925km (Cold Spaghetti at 4,925km) as an extra course at the suggestion of proprietor Stefan Wieser. 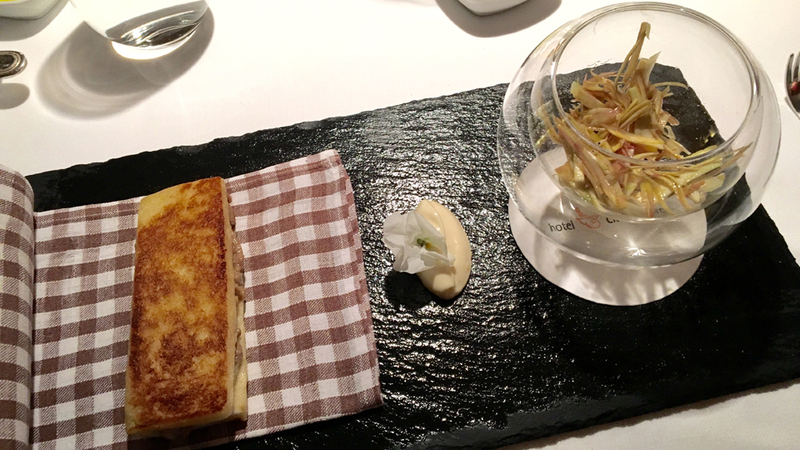 The scampi and pigeon toast is a marriage of the pure (the scampi) and more comfort food elements (the smoked pigeon toast). Both components of the dish work amazingly well together, although the artichoke salad, while tasty, does not really add anything. Metullio’s gnocchi are off the charts. Soft and incredibly delicious, the gnocchi are sublime. La Siriola’s Cold Spaghetti at 4,925km is a work of culinary brilliance that also embodies the spirit of Metullio’s cooking. The dish gets its name from the total number of kilometers of distance between the La Siriola and the places where the ingredients are sourced. Served cold, the spaghetti is nevertheless full of beautifully delineated flavors. Pork served in two courses follows. The first preparation consists of roasted pork with sauerkraut purée, anise sauce, horseradish, pak choi. A morsel of smoked pork belly with green apple and almond follows. La Siriola’s winelist is unusual in its focus on international wines. We spent most of our week at La Siriola drinking German and Austrian Riesling. 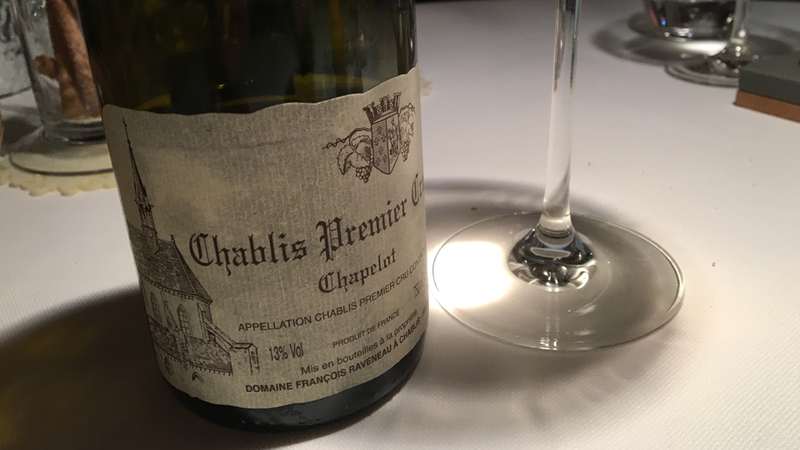 On this night, I could not resist Raveneau’s 2009 Chablis Chapelot, a selection from Montée de Tonerre that the domaine only bottles in some vintages. Silky, radiant and wonderfully open-knit, the Chapelot is a gorgeous wine to follow during the course of the evening. I don’t see it developing into a mythical bottle of Chablis, but it is absolutely delicious on this night. Burlotto’s 2004 Barolo is a pure joy to taste and drink, as it is just beginning to show the first signs of aromatic nuance. The 2004 is also a poignant reminder of just how far the estate has come in recent years. Perfumed and silky, as the 2004s are, Burlotto’s Barolo is satisfying without being truly epic. It doesn’t matter. A more important wine might have dominated over the food. On this night, the wines play more of a supporting role rather than the lead, but it all works beautifully. At this point, Metullio summons guests into the chocolate room for a pre-dessert of freshly prepared mint ice cream on a stick covered with chocolate, which makes for a wonderful palate cleaner. 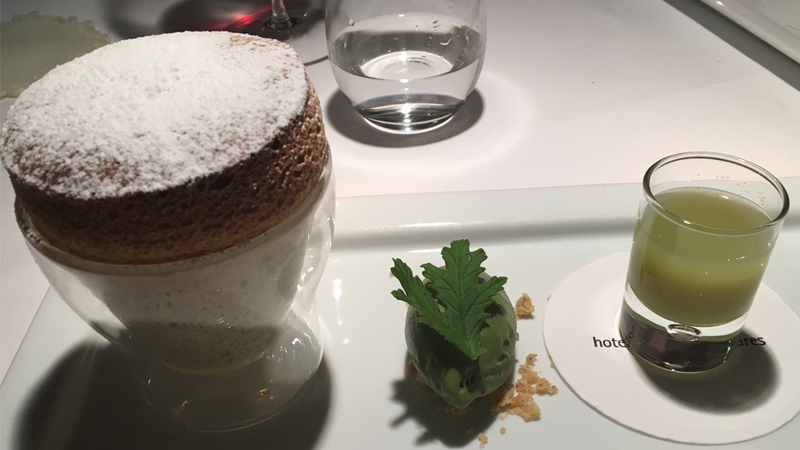 The Bronte pistachio soufflé with green tea, green apple smoothie, ginger and celery is eccentric and also a satisfying conclusion to this sublime dinner. I have been visiting Alto Adige at least annually for close to twenty years. I never tire of the breathtaking scenery, world-class food and wine, and warm hospitality. Readers who want to discover the best Italy has to offer should be sure to spend some time in this bucolic, fairy tale region in northern Italy steeped in history and culture. La Siriola is a great place to explore the more ambitious side of Alto Adige. I can’t recommend La Siriola and Ciasa Salares highly enough.